Robert is a visual marketer and content strategist at Bannersnack, a professional banner creation app for marketers & small business owners. He's passionate about visual marketing, Instagram marketing and content marketing. 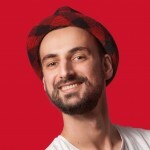 His work has been featured in The Next Web, AdWeek and The Content Marketing Institute.